I probably looked at the whole thing from a much too personal viewpoint: iconic to me, or my personal context; sorry. As I mentioned above, I'm not a collector, just a fountain pen user who's occasionally impressed by a certain pen. Your response seems entirely in the spirit of the question. The OP asked about 'favourite iconic pens in terms of aesthetics'. I chose archetypal, influential, innovative pens - some of which are arguably iconic - but in the end they made the cut if I like how they look. Maybe the Parker 51 is the purest expression of its type but to me the Aurora 88, Omas 361 and Parker 61 add something to the form that elevates them aesthetically. & that's where these threads always end up (which I suppose is expected and fine). But i personally think "iconic" implies something that goes beyond a single individual's view and is something more broadly seen as a significant and recognizable artifact within a culture and time. Otherwise people can just shout out any pen they want. Honestly these threads come up from time to time here and on that other board (*spits*) and they all go exactly like this. There are few posts that mention some genuinely iconic pens and try to stay within the bounds of something reasonable, then some absurdities, some borderline cases devolving into a semantics argument, and then someone will post the dictionary definition and then someone says Parker 51 . . . The wheel. It go round. Last edited by stub; July 28th, 2016 at 12:39 PM. & that's where these always end up (which I suppose is expected and fine). But i personally think "iconic" implies something that goes beyond a single individual's view and is something more broadly seen as a significant and recognizable artifact within a culture and time. Otherwise the people can just shout out any item they want. but honestly these threads come up from time to time here and on that other board (*spits*) and they all go exactly like this. There are few post that shout out some genuinely iconic pens and try to stay within the bounds of something reasonable, some absurdities, some borderline cases devolving into a semantics argument, and then someone will post the dictionary definition and then someone says Parker 51 . . . I think part of the issue is that there are influential items, ones so successful that the whole market changes (the Sheaffer Balance shape) and ones that are so different but not successful enough to be imitated and copied across the board (like the Sheaffer Snorkel system). Then there are the trends that sweep across the board, (the movement to slim cylindrical pens of the 60-70s) and the technological changes (extruded plastics, textured plastics, the ability to work with almost all of the Platinum group metals). Each generation has it entry level pens (Sheaffer Cartridge Pens, Parker 45, Pelikan and Lamy and Geha, Plataginum and Esterbrook and Wearever). There was the influence of the Multinationals, notably Parker and Sheaffer and Waterman that had so much influence of the pens made in other nations. When those factors get mixed in with personal experience and preferences we get the lists de jour. For me it is not about iconic or wider recognition in the community. my favourites all have something special about their nib. the best nibs in Europe are from the 1930's to 1950's. it is just a shame that I have some trouble with my hands and that I have to look for the bigger pens, which are ever so expensive from that period. I also cannot get along with the Parker 51's which has the ideal length for me due to their naily nibs. So my favourites are Pelikan, Montblanc and Soennecken, which all come at a price, but the nibs on most of them are special. When my FC 66 desk pen arrived, I right away thought "iconic desk pen". That said, I'm sure there are specimens of desk pens out there that are more iconic-er than mine in some way but this one embodies and improved all the ones I'd seen on my Dad's desk while growing up. Omas 360 - I use one for a daily writer, its intuitive for me. Nakaya Dorsal fin 2 - wont roll off the desk, but gets the least use due to the choice of nib I got with it suits letter writing more than note taking. Last edited by notsim; August 1st, 2016 at 05:21 PM. For my is a Inoxcrom Sirocco. I love this pen. The family Sirocco (I have few different) are my favourite of the spanish company Inoxcrom, but the most iconic of Inoxcrom is the Inoxcrom 55. These days "Iconic" to me has become "instantly recognizable when used in a video play". So the Montegrappa that appeared in an episode of Bones, and the slightly iconoclastic Parker Vacumatic that was a clue in an episode of Poirot, would qualify. Naturally different people, having different experiences would recognize different things, so in this context they would likely see others as "Iconic". In its more original meaning of a symbol of the times, I would class the Parker 50 Falcon as an icon representing the space age aspirations of the cold war era. But most people would likely not recognize one. In the same vein the Eversharpe Skyline represents the streamlined aspirations of the late 1930s, and perhaps the Esterbrook line represents businesslike efficiency. The gold filigree wrapped Aikin Lambert is an icon representing the last gasps of imperial elegance, wealth and stature. The Mont Blanc 149 is an icon of status, and the Hemmingway is a baton of power. The Montegrappa Chaos pen is an icon representing every part that Sylvester Stallone has played as well as representing unabashed wealth. When we call something iconic, does this mean something recognizable to everyone, or are there icons that pertain just to small segments of the population? Thus Inoxcroms, unknown to most are iconic to some segment only? Based on the definition, in spite of the changeability of language, I think the entire topic is balderdash. Last edited by pajaro; August 5th, 2016 at 05:20 PM. "A single dream is more powerful than a thousand realities". J. R. R. T.
Nothing wrong with the topic; it's just that the term "icon" has become subject to personal whims. The most admired icons of the FP world are far too many to mention. Which makes the hobby of Fountain Pen collecting that much more profound. I have a MB 149 fine nib ground to an fine italic that is perfect to write with. It is a 149 and makes my handwriting look much better that I deserve. Then there is a Pelikan Sovereign 450 in green tortoise. Mouthwatering instrument! Then a Nakaya Burl-wood in a medium right oblique. Again it improves my handwriting 5 levels! Add to those a Faber Castell Walden Woods. Perfect right out of the box. A MB Traveler that has indeed traveled. A Omas Arco that speaks for itself. I can't go on as there is not enough webspace to document the joy!!! But suffice it to say that our hobby of acquire fountain pens is something quite unique. We can collect them, admire them, write with them, and enjoy an increase in value if we purchase them wisely. Interesting meta discussion, I read it all. For semantics sake, I meant iconic as widely recognizable, and the following words were in terms of aesthetics. What I didn't get across successfully was: seeing a pen shape, recognizing it or its influences like a thread of design. As mentioned by many the 51 was an inspiration and widely recognized shape. The Doric inspired OMAS to no end and perhaps other vintage italian makers. The Skyline is the peak of streamline design. All this is just to suggest where the general population might be when it comes to recognizing fountain pens. Of course amongst fountain pen geeks there’ll be a wider variety of specific pens and a greater sense of history, as we have seen in this thread. Meanwhile, on Google Images, the first hit for "iconic fountain pen" is a Lamy 2000. 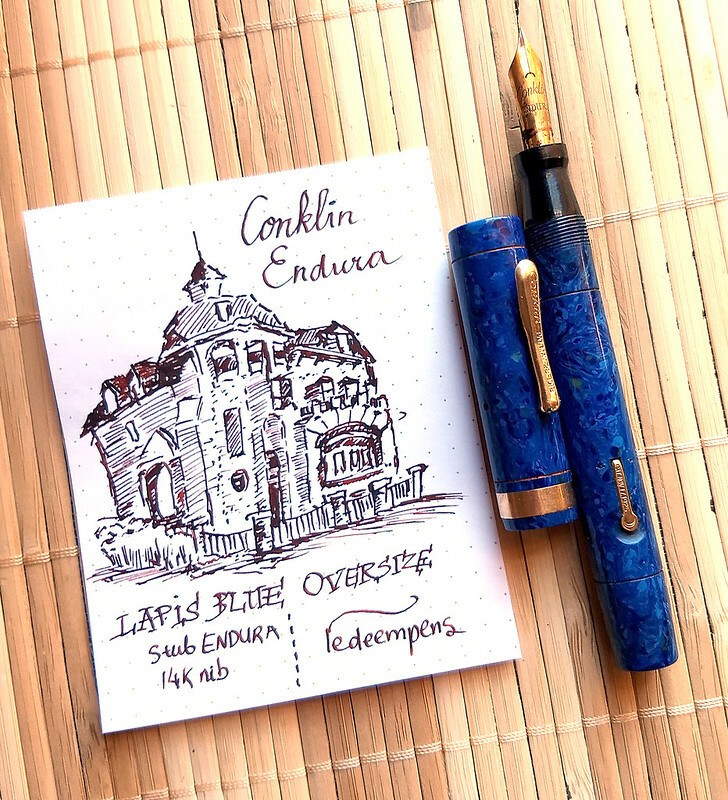 Conklin Endura Oversize in Lapis Blue. I re-built the pen from just barrel and cap. Last edited by penwash; January 29th, 2019 at 10:14 AM. I think that even by modern standards the Lamy 2000 is now considered to be an iconic pen. My personal iconic pens in terms of aesthetics would be a Montblanc 146 and a Parker Duofold Centennial.